I am having a major “practice what you preach” moment. Overall I would say I have a pretty relaxed approach to nutrition and wellness. I am also frighteningly good at rationalizing my choices. But every once in a while an alarm goes off. Either I am pushing too hard, or not hard enough and something is thrown out of balance. Food is a tangible place to start. What can I do more of? What am I missing? Then there are the other voices in the chorus that are starting to sound a bit off-key: time management, stress, work, exercise, creative outlets, relationships. Where am I on these? Are there one or two loud ones that need my attention? Ok, I know I said “alarm” which sounds super negative, but I am secretly proud that my body let’s me know that something is out of whack. It is a sensitivity that I have built over time, and I remember the days when I would just plow through the imbalance until I was literally beat and forced to spend a few days in bed. I used to get so mad at my body for not performing how I wanted it to. Now at these moments I can take a bit of inventory and re-invest in some of my old favorite strategies of self-care. This is also when I am reminded that the practice of nourishment cannot be unlearned even if it gets sidelined for a little while. And just as I cannot blame one thing for the imbalance, I cannot count on one thing to correct it. Luckily I find that there is a positive snowball effect for making better choices, the healthy ones seem to stick as you gain momentum (just as the less optimal choices tend to send us rolling). So I decided to take my own advice – pick something small and see what naturally follows. 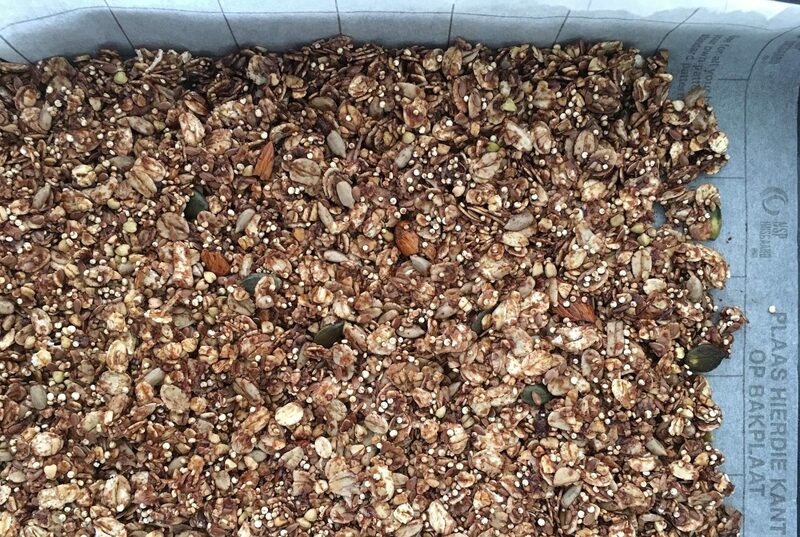 This is a basic granola recipe, you can substitute different seeds and nuts that you have on hand for the quinoa. If you like dried fruits in your granola, add them after the first flip or they are likely to burn. If you want your cereal to be more clustered – add one pureed banana to the wet ingredients. As with most of my recipes, I use a water glass to measure the ratios here. Preheat 175C ( 325 F). In a small saucepan melt the coconut oil with the honey, cinnamon, and cacao stir until smooth. Mix your dry ingredients in a large bowl and pour the chocolate mixture in. Toss to coat well. Spread the mix out on a parchment lined baking sheet pressing into one compact thin layer (I use a silicone spatula or oiled fingers). Bake for 15 minutes and then flip over large pieces of the mixture ( it should start to stick together enough for you to flip sections- but if not don’t worry it will be delicious). Cook for another 7-10 minutes until it smells toasted. Remove from oven and let the mixture cool completely, it will continue to dry out as it cools. Store in an airtight container for up to month.